Up the cuddle quotient of our fleece blankets with velvety soft microfiber fleece. Treat yourself or give as an extra special gift. Wrap yourself in our luxurious, ultra-soft Sherpa blanket. The perfect gift to give or keep. Glance around your home, and you'll probably spot plenty of pillows and blankets. Whether you're snuggling up on the couch for a movie night or getting a good night's sleep in the bedroom, pillows and blankets are a must to improve your comfort. 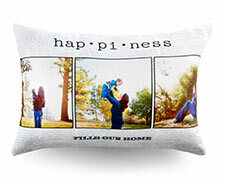 With Shutterfly's extensive line of pillows and blankets, you can enjoy this comfort, along with a stylish touch. These personalized pillows and blankets add color, personality, and customization to any room of your home. 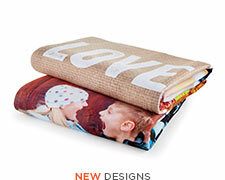 Get cozy with Shutterfly's customized pillows and blankets. You can find indoor and outdoor pillows that add a stylish accent to a sofa or chair. Add a favorite photo to add a supremely personal touch to these accent pieces. Personalized blankets come in a variety of styles. 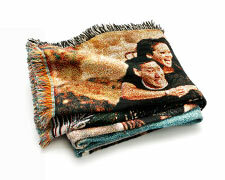 You can find soft microfiber fleece blankets, cozy Sherpa blankets, and woven blankets made of plush cotton. Or, create a family heirloom that you can pass down from generation to generation with photo quilts. In addition to enhancing your home with these personalized pillows and blankets, these products make excellent gifts as well. Celebrate a special occasion like a birthday or wedding with a customized pillow or blanket. Housewarming, graduation, Mother's Day, and Father's Day are other gift-giving occasions perfect for these personalized pieces. Explore other personalized gift ideas as well so that you find the right gift for your recipient. Skip the interior designer and instead turn to Shutterfly's easy-to-use design tool to create pillows and blankets customized for your home. 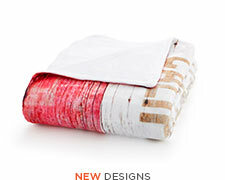 Once you select the style of pillow or blanket you want to create, it's easy to get started. Explore different collections, which feature an array of designs and color schemes. Select a design with the right number of photos for your pillow or blanket. Then, choose the size of the pillow or blanket and its material. Once you've made these selections, it's time to create. Select a background and layout for your pillow or blanket. Make sure the background complements your home decor. Then, upload your favorite photos and add any necessary text to the piece. 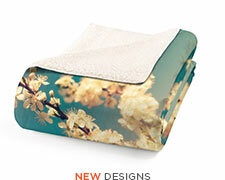 Soon, you'll be enjoying plush comfort with this one-of-a-kind addition to your home decor. Photos bring memories to life, which is why Shutterfly offers many ways to add photos to your home. Personalized pillows and blankets allow you to add unforgettable memories to functional pieces of home decor, giving you a one-of-a-kind piece for your home.